Viols don’t have to be hidden! Even if a gig-bag or a hard case protects them perfectly also at home, both have one thing in common: They hide your viol - what a pity! Stands are very common for guitars but in most cases guitar stands don’t fit for bowed instruments. And they never offer an opportunity to store the bow. 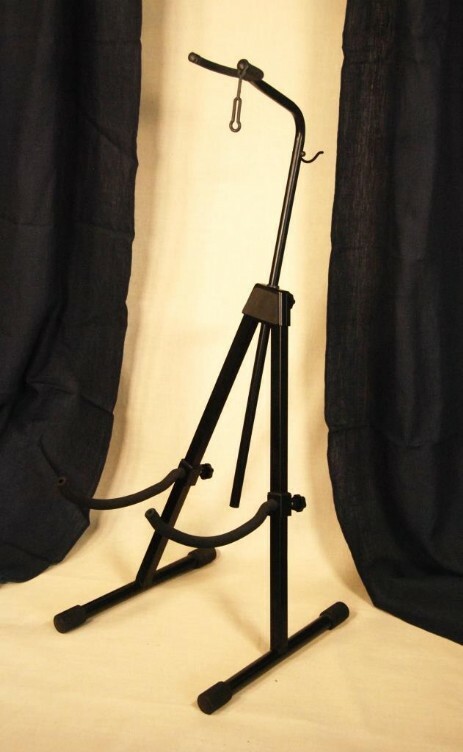 Our stands are designed for bowed instruments. They offer a neck support that can be adjusted in different hights and a hook at the rear where you can just hang in the bow. Ideal for the stage and for the home use as well. Both stands have a mechanism that allows lifting the stand without the danger of losing the stands stability. For transport they can be easily clapped together. The two holding bars are covered with a soft material as well as the neck holder. The small stand is suitable for violins and treble viols, the bigger one for tenor and bass viols. A stand for a violone or double bass is also available. Unfortunately the stand shown in the photo above is not available anymore from our supplier. We've got a new model in stock which is a very good replacement as it can be adjusted to fit for tenor and bass viols as well. The stand is made from black metal and is fully foldable. Photos will be here soon!